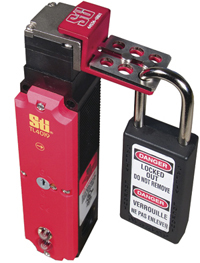 Omron Scientific Technologies, Fremont, CA, introduces its SLD-series switch-locking devices. The series enables personnel to quickly lock a safety interlock switch to a safe position, allowing for certain types of maintenance. It is intended for use as an alternative control method while performing tasks that are routine, repetitive or integral to the production process, as provided for by standard ANSI/ASSE Z244.1-2003 section 5.4. See also: Omron Scientific Technologies, Inc.